Merlin 4.03 Deleted Scenes - Six - A/G. . Wallpaper and background images in the Arthur und Gwen club tagged: arthur gwen bradley james angel coulby. Also how she encourages him to follow his insincts despite everything. That is a "real conversation" I wanted for them! AGAIN. No time for this. Scratched to make time. I am sure of it. Not important to the episode. Sure, all of us would have loved to finally heard a conversation like this. But it took up precious time from the M/A episode. Like a couple of others have said, if this had been made a two-parter, they could have adequately included scenes like this one, Uther's death would have been given the importance that it did not receive, the impact on Arthur and the support he should have received from ALL those who love him could have been properly focused on. Methinks we're right that this season is getting way too much jammed in. I think that's part of what we're feeling. That scene reminds of S3 ep2 the Tears of Uther Pendragon. The exact same thing when Gwen came to see him in his chambers. And yes Stace, they are morrons, idiots, utterly. Exactly, Nat. I read that last line and thought, "They're recycling lines again!" This episode SO should have been 2 episodes. To me this scene gives us insight into how Gwen feels about magic, and how would Merlin reveal his magic to both Arthur & Gwen. It also reinforces the times that Gwen has visited Arthur and what those visit and opinions mean to him. In saying that you would think that they would have made this into a two parter. But 8 scenes, not 1 or 2 but 8 of Arthur/Gwen scenes. I mean if they were going to cut any scenes in that episode, did we need to see the 30 sec scene of the acrobats at the beginning couldn't they just refer to it. I also read somewhere that Uther gave his fathers ring to Arthur for his birthday, where was that scene, I'm wondering if Arthur would wear his fathers' or grandfather rings. This is the cut scene I would have liked to see the most. I had no clue how Gwen felt about magic but I never would have thought that she blames it for her father's death. This is key. We know exactly how the other 5 main characters feel/felt about magic but not Gwen. This brief scene could have provided some much needed insight into her independent thoughts. Wow, this is the scene that I know was missing. Yes, it would have taken about three mintues but notice we have Merlin doing basically this at the window. Now I'm sure Merthur fans are behind this. Why? Because I've read too many times where they are mad at Gwen because she's "taking Merlin's place" where Arthur is concerned. With Arthur saying "I value your opinion above all others" OMG!!! They would be screaming the hate. 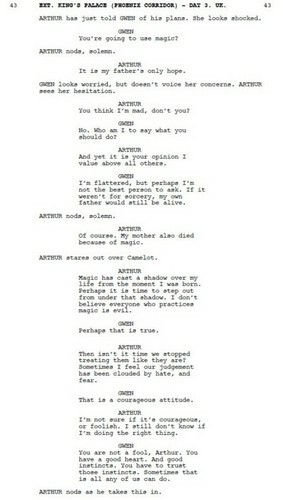 Merlin's opinion is more value to Arthur than Gwen's, Merlin is is adviser to them. This scene has to go. Some don't even want to see them get married in this show at all. They know it has to happen but they don't want it to be apart of Merlin at all. This saddens me greatly. It's down right ugly to me now. See, this scene is the development in Gwen's character that is so needed. She has got to be developed. This is season 4 when in the hell do they intended to do it? The last three episodes in season 5? This is shameful. They had no problems developing Morgana's character in the last three seasons and in fact did it during the development of both Arthur and Merlin's relationship and their characters individually. What's the problem here? Morgana is gone, basically and we still get this half baked crap? I'm thinking the Merthur fans are doing much more then watching the show. I also would have loved this scene in there because we all know that Gwen is the one who encourages Arthur when he is not too sure of himself or his decisions. 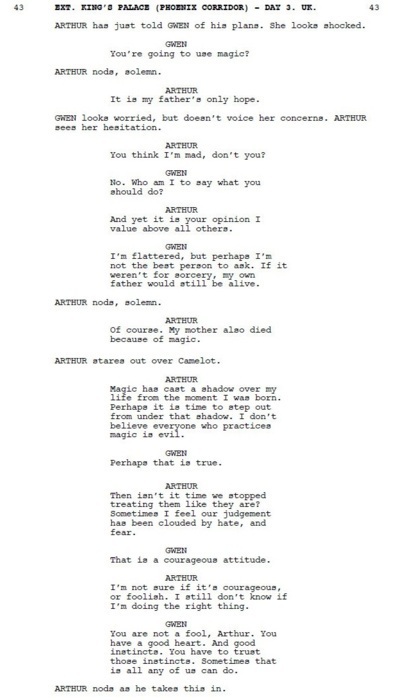 Now because he never actually tells her of his plan beforehand, its like a secret that will be between them and we already know Arthur feels regretful and guilty for using magic. I wonder how this will work out in the coming episode or next season. Before this he was not as against magic as Uther but after the death of his father, he has gone to the other extreme. if I were Gwen I would wonder why. Its a pity that in this drama a lot of things get left hanging.